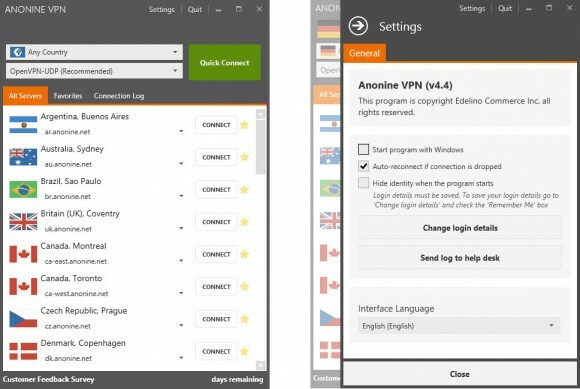 Anonine VPN lacks in the customer support and torrent speed departments. We feel that even though they are on the right track regarding the website, software and prices, there is a lot of work to be done in order for them to compete on the market. Anonine is a VPN service operating under Edelino Commerce Inc. which is a Seychelles based company. They are most likely physically based in Sweden as they were before being bought by Edelino Commerce. They require an e-mail address to sign up for the service, but apart from this, it really depends on the payment method you will be using for the purchase. As far as the available locations go, they have servers in the following locations: Argentina, Australia, Canada, France, Iceland, Italy, Luxembourg, Netherlands, Panama, Russia, Sweden, Singapore, Spain, Switzerland, Turkey, United Kingdom and USA. Anonine VPN offers proprietary applications for Windows, Android and iOS. Once the account is activated, you are taken to your main account screen, or the Dashboard, which is very and logically made to give you the information you need for connecting to the service. From here, you can choose which client you need to download and proceed with the installation process. The Windows software performed very well. It was fast, there were no disconnects or crashes and, just as the website, it was very intuitive. 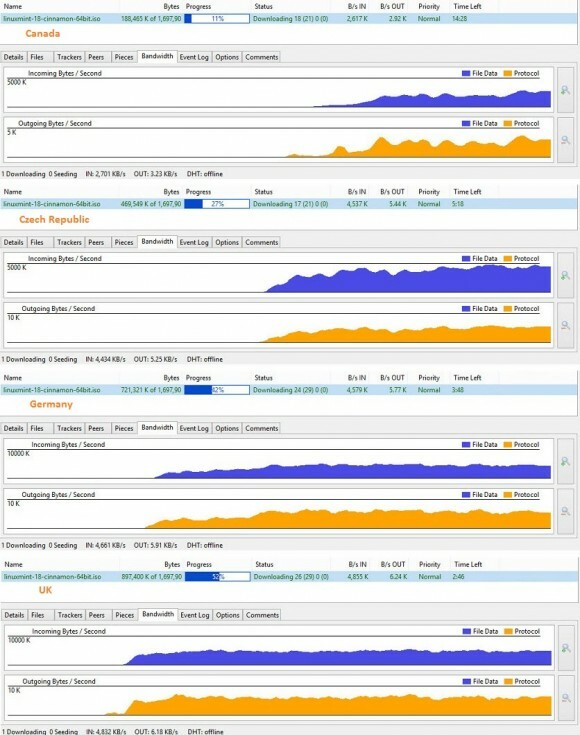 You can easily select your server location from the main screen. Even thought they can be changed without disconnecting from the existing connection, we always recommend disconnecting first to avoid any glitches. The settings page has an option for auto-reconnect and there is also a possibility to send your logs to the customer service team directly. The main application allows you to set up a list of favorite locations and also has a connection log available in order to see the connection details in real time. This is a very useful feature especially if there is any troubleshooting required. 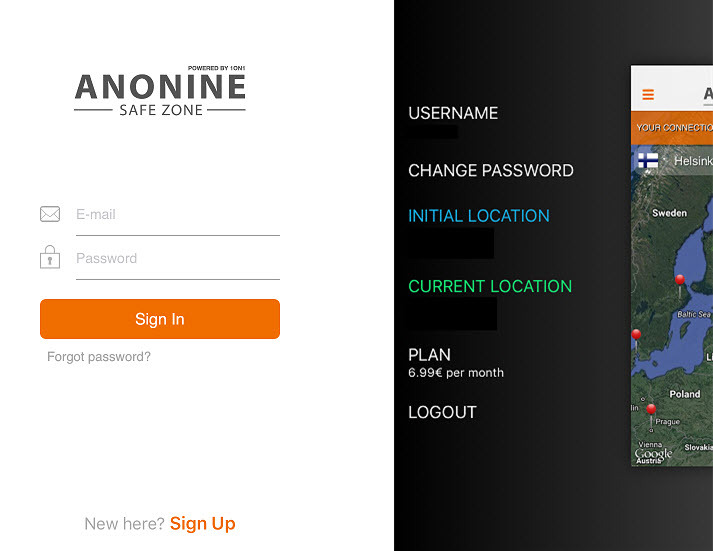 Anonine offers a few features we like that we already mentioned, such as the logical dashboard, intuitive application and auto-reconnect feature in their proprietary software. This may seem like a must to a lot of the readers, and they are right to feel this way, but unfortunately there are still a lot of VPN providers that do not have these simple yet extremely useful features implemented. 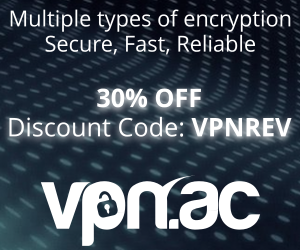 Anonine supports the following protocols: OpenVPN, PPTP, SSTP, L2TP (over IPsec). They allow 5 simultaneous connections although we weren’t able to find whether this means that you can have 5 devices connected on the same server or 5 devices on different servers at the same time. We addressed this issue with the technical support department, but there was no answer. They advertise 2048bit encryption, which is improperly stated to say the least yet quite common “bigger is better” gimmick. This is referring to the RSA encryption used for key exchange. The encryption used for data is AES 256 CBC. They also exaggerate some features on their website, for example claiming that you are browsing anonymously or that their prices start from 3.99 euros/mo. (which is actually the discounted price for the annual plan). These are not completely erroneous statements, but rather marketing gimmicks used by some of the providers to give their product a more advanced or trust-worthy feel. While P2P is blocked on the US servers, we would like to mention that we were able to stream Netflix content successfully at the time of this review. This is not something that is guaranteed on the long run due to the continuous efforts that Netflix is making in order to block non-residential IPs, but for the time being we wanted to mention it in case it is one of the reasons you are looking to use acquire a VPN service. Even though they were not the best we’ve ever seen, the results were more than decent and the experience was great. There were no disconnects, interruptions or issues whatsoever. This had a lot to do with the fact that the software also performed exceptionally and that the connection was made very easily. While the download speed was not terrible, it was definitely lower that what we expected, and we are sure that it can be raised if the infrastructure would be improved. The platform seems to be improved and maintained well, bit it’s just lacking that extra boost to make it stand out of the crowd. The Android application is very intuitive and we like the fact that they kept the connection map similar to the Windows application. The apps are not identical, but the similarity is there and we like that from a functional point of view, it performed just as well as the Windows one. One thing that we disliked is the fact that the settings screen did not offer more than some basic connection information. The customization possibilities are not there. Some locations performed better than others of course, but overall we were not impressed with the mobile speed which was below average. This however did not reflect too much in the browsing experience. We were able to browse and stream media without any issues or interruptions. There were no differences in the speed test results that we ran on the same servers as Android. The price is not high and we find it to be fair compared to the service provided. 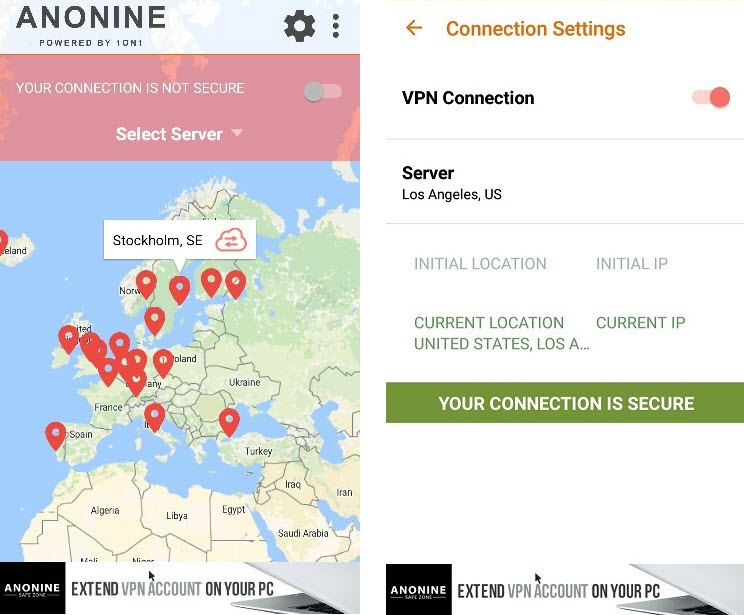 We didn’t find as many payment options with Anonine as we have with other VPN service providers, however we feel that the number of payment methods available is decent and should fit most customers’ needs. Anonine also has a refer a friend program that can get you credit with their service, and there is also an affiliate program available. You can check out the details here if this is something that interests you. Keep in mind that this will only be available if you have an account and are currently authenticated on their website. The technical support experience with Anonine was abysmal. We sent them over eight requests and only one of them was replied and even that response was incomplete and incoherent. We did appreciate the fact that they have a very good FAQ page that is well structured, so most of the issues can be answered directly on the website, however, we had an issue for example with the bitcoin amount requested at payment not being accurate. We sent the request in and several days later we still didn’t receive a response. We used a different payment method, and only after submitting a ticket from our account did we receive an answer (incomplete and incoherent as mentioned before). This goes to show that they probably only answer request to customer e-mail addresses, which is a bit odd, seeing how if there is an issue with the payment such as in our case, they would be missing out on a potential client. Apart from the well structured information included in the FAQ page, there is also a “guide section” if you will, on the left hand side of the FAQ articles. These guides will help you with the setup process regardless of the operating system or protocol that you may be interested in. Very well structured website, intuitive and user-friendly. Software available for all major operating systems. Software is very intuitive, fully functional and feature-packed regardless of the operating systems we are talking about. Good prices, especially if you take advantage of the yearly bundle. Decent number of payment methods available. 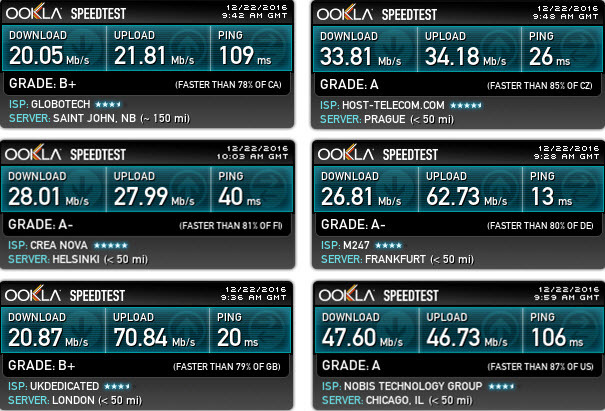 Good browsing speeds and performance even when streaming media. A good assortment of server locations available. No about page and very little information about the company’s actual whereabouts. Gimmicky claims and advertisement of certain features on their website (such as anonymity). 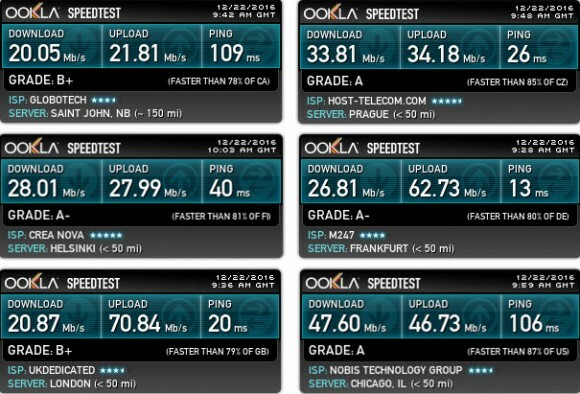 Speed test results could have been better when it comes to torrent downloads. The technical support was terrible, there is no excuse good enough to justify our experience with them. Taking into consideration the aspects mentioned above, we give Anonine a 5/10 due to the very poor customer service experience and the rather average torrent download speeds. Overall there are a lot of things that Anonine is doing right, but the ones that it is still having issues with, drastically diminishes the quality of the service. Having responsive customer support and perhaps improving the infrastructure could be the answer.